Text messaging is very popular these days for anyone with a smartphone and billions of texts are sent each day in the United States. The ability to send a text message to emergency services is something new to public safety and Lapeer County was the first in the State of Michigan to implement the service. Click here to see a map of counties in the state and their text to 911 service status. While the service is still in its infancy, it can be a valuable tool in certain situations. 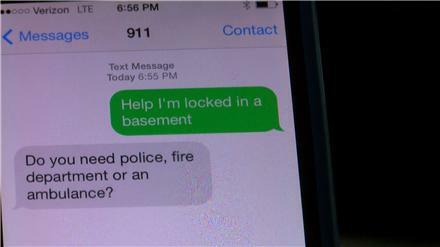 An example of where texting to 911 would be appropriate is when a person is hiding in a closet from an intruder in their home. Texting would give the advantage of being silent and still getting a hold of help, whereas calling on the phone could possibly give your hiding location away. Another benefit would be when a cell phone has too poor of a signal to make a call. Sometimes with poor signal a text message might still get through, especially if a person is lost in the woods and is far from a cellular tower. We wish to caution everyone that the text to 911 service may not always be the best option to choose in an emergency. Texting emergency services can be much slower compared to a regular telephone call, causing delays in gathering information and sending help. By calling 911 on the telephone dispatchers can gather information more quickly and efficiently and get help coming much faster. Additionally, a telephone call can help dispatchers learn more about the situation by hearing background noises, the caller’s tone and demeanor as well as provide better assurances to the caller that they’re being helped. In medical cases, a regular 911 call can provide pre-arrival instructions which will help patients before an ambulance arrives on scene. Lapeer County Central Dispatch has text to 911 support for AT&T, Sprint, T-Mobile and Verizon Wireless. If there is a problem with a particular carrier’s service or your carrier isn’t supported by the text to 911 service, and you attempt to text 911, you will be given a bounce back message from the carrier advising you to dial 911 on the telephone instead. Sending fake or prank texts to 911 is a prosecutable offense just the same as abusing the 911 system in general. We at Lapeer County Central Dispatch encourage everyone to make a regular telephone call to 911 in emergencies when they are able to, rather than text messaging to 911. That will aid us in getting you help much faster.